Stainless tank with hinged cover, with mounting bracket for PID digital controler, with sloped bottom (for better watter separation), with 1/4 female thread for draining the tank, for oil outlet to heating block and for oil supply fitting. 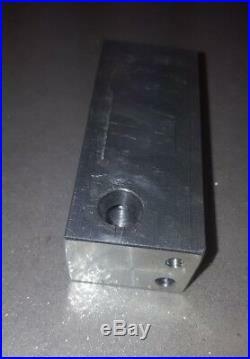 + aluminium block with long banjo bolt and seal (crush) washers. 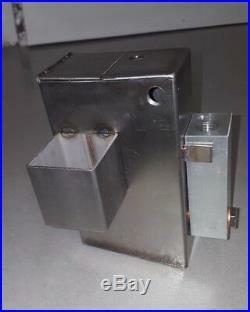 The block has mounting/oil supply hole, 6mm thru hole for heating cartridge, M6 thread for K temperature sensor. 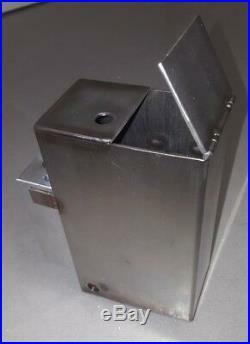 Main tube dimenssion 60x100mm x 2mm thick , stainless steel. You only get what is in the picture. The item "Fuel tank with aluminium block for waste engine oil free heat Altölbrenner" is in sale since Wednesday, January 17, 2018. This item is in the category "Heimwerker\Installation\Heizung\Brenner & Kessel". The seller is "robi-loti" and is located in martno pri litiji, ljubljana. This item can be shipped worldwide.